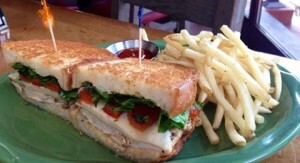 Grilled Chicken Havarti Sandwich. 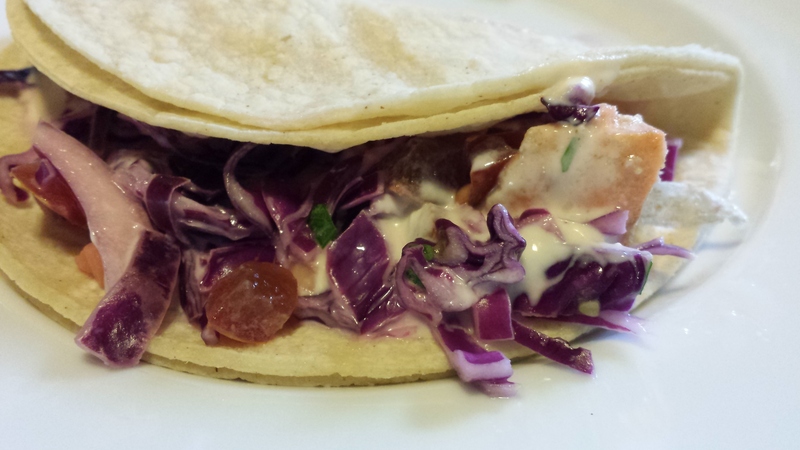 It’s one of my favorite sandwiches that is served at the Great American Restaurants Group. GAR locations are great for classy casual lunches and dinners. 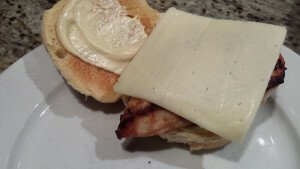 I’ve probably eaten 50 of those Chicken Havarti sandwiches over the years. We love the various locations including Arties, the different Sweetwater Taverns, Mike’s American Grill, Coastal Flats, and the Carlyle Grand Cafe. 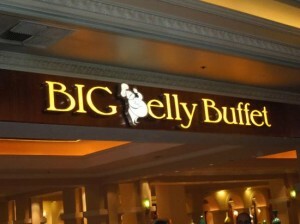 Consistently good food and consistently good service. 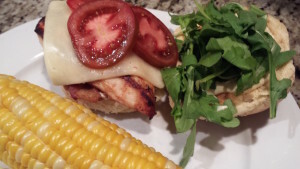 When I’d order the Grilled Chicken Havarti Sandwich it would come like this: Toasted bun with a grilled boneless chicken breast topped with a slice of melty Havarti cheese, a few strips of crispy bacon, some baby arugula, and sliced tomato. A mustard mayonnaise was slathered on the bun. That grilled chicken sandwich was probably my favorite sandwich for lunch. They’ve changed the sandwich slightly these days so it’s not exactly the same as the original. 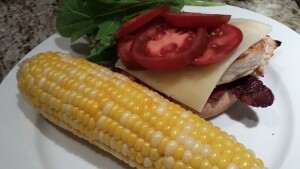 The tomato was replaced by roasted red pepper, and the bun was replaced by thick white toasted bread. And I believe that they have removed the bacon strips. 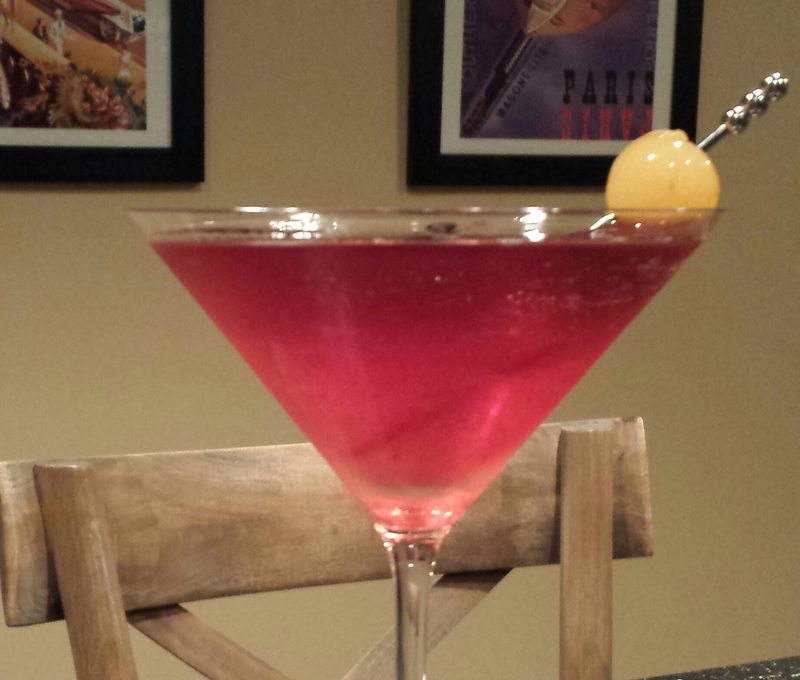 As I’ve mentioned, we don’t eat at restaurants very often which inspires me to recreate restaurant meals at home. I’ve mostly recreated the original sandwich. I prefer a toasted whole grain bun to the toasted white icebox bread that is now used at the restaurant. And I don’t use the roasted red peppers in favor of sliced tomato. I like to marinate the chicken in some lemon juice and olive oil before grilling. Marinate the chicken for at least 30 minutes in the refrigerator. Then, over medium heat, grill the chicken until cooked through in a grill pan . You can also use a BBQ grill. Fry some bacon until crispy while you are grilling the chicken breasts. Drain the bacon on paper towels and set aside. Toast the buns and set aside. 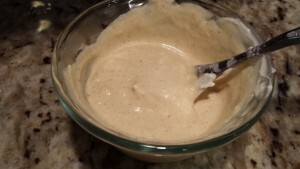 Mix together mayonnaise and a grainy mustard such as Maille . 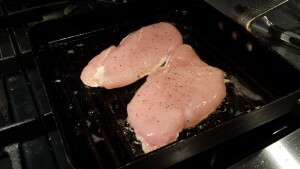 When the chicken breasts have grilled to your liking and are fully cooked, remove them from the pan. Spread some mustard mayo onto the toasted buns. Place two slices of bacon on each of the bottom buns. 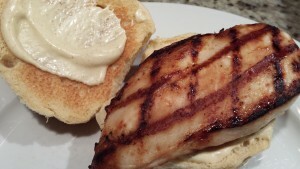 Top the bacon on each sandwich with one of the grilled chicken breasts. Fresh arugula and sliced ripe tomato are good fixin’s for this sandwich. 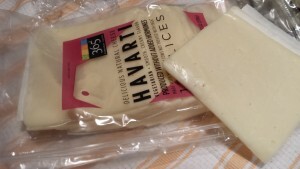 Add a Havarti cheese slice to each sandwich. 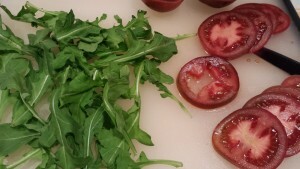 And add the tomato and arugula. And the sandwiches are ready to serve! 1. Sprinkle salt and pepper on the chicken breasts. Marinate the seasoned chicken breasts for at least 30 mins or overnight in the refrigerator with the lemon juice and olive oil in a Ziploc bag. 2. Heat the canola oil in a grill pan or heat a BBQ grill. 4. While the chicken is grilling, crisp the bacon in a pan. 5. 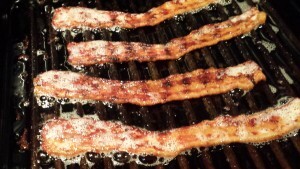 When the bacon is crispy, drain it on paper towels and set aside. 6. Turn on the broiler. 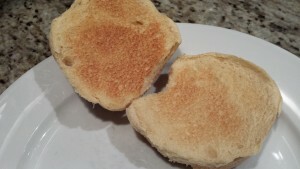 When the broiler is ready, toast the buns until they are golden brown. Remove buns from oven. 7. Mix together the mayonnaise and the grainy mustard in a small bowl. 8. Spread the mustard mayo on the toasted buns. 9. 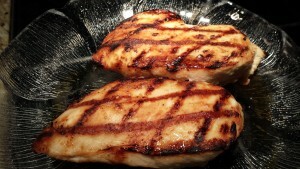 When the chicken is cooked to your liking, remove the chicken from the grill pan or grill. 10. Place two slices of crispy bacon on each bottom bun. 11. 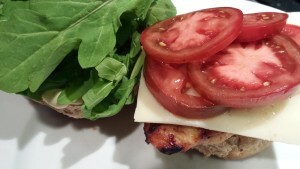 Place a grilled chicken breast on the bacon slices on each sandwich. 12. 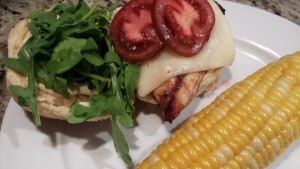 Top the chicken breasts with the Havarti slices. 13. Add some arugula leaves and a few tomato slices. Makes two sandwiches. Offer with a vegetable such as corn on the cob or some seasoned oven fries. 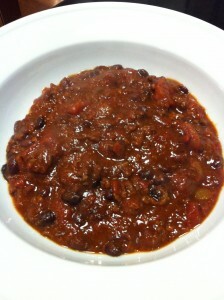 My Honey Mustard Baked Beans go well with this sandwich. Or try my Dill Potato Salad with Greek Yogurt. My veggie-laden Colorful Chopped Salad is another good option. 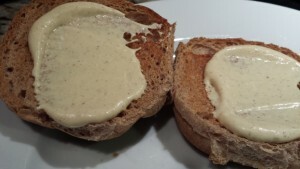 Variations: Try some honey with the mayonnaise instead of the grainy mustard. Substitute lettuce leaves for the arugula. Use chicken tenders instead of a chicken breast. Try turkey bacon instead of regular pork bacon. Get your own grill pan from Amazon.com. I have the regular version of this pan and I love it!